In celebration of Women's History Month this March, I wanted to include a selection of books all about not so known women in history and their great accomplishments. Raising two daughters of my own, I love when I stumble upon books like Hedy's Lammarr's Double Life: Hollywood Legend and Brilliant Inventor, by Laurie Wallmark, to share with my girls, as a reminder that they can be anything they want to be, and it that means doing a two or more careers or pursuing a few hobbies, they can...and here is just one lady who did just that. Now, Laurie Wallmark and Katy Wu, who collaborated on Sterling’s critically acclaimed picture-book biography Grace Hopper: Queen of Computer Code (2017), tell the inspiring story of how Lamarr developed a groundbreaking communications system during World War II that still remains essential to the security of today’s technology. 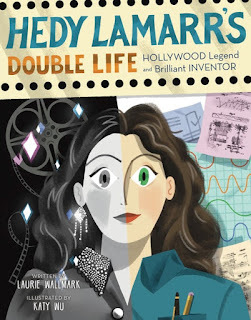 HEDY LAMARR’S DOUBLE LIFE (Sterling Children’s Books, February 2019) is an inspiring biography that will interest not only science and computer-obsessed kids, but also parents, grandparents, teachers, librarians, and STEM professionals." With Women’s History Month coming up in March, and interest around Gal Gadot portraying Hedy Lamarr for a Showtime series, the timing couldn’t be more perfect for this new release. Even though this book is geared to towards children ages 5+, I would suggest it be shared with older kids, say 8+, as the the story itself it long and goes into technical details of Hedy Lammarr's frequency hopping invention. Both of my girls, who are 7 and 8, loved the book, as they enjoy learning about people in history and inventions. This book really does a great job in providing a timeline of Hedy's life, including both her life and success as an actress, as well as her life as an inventor. As a parent to two young girls, I love to share books like this, that showcase women in history. I don't know about you, but I had no idea Hedy Lamarr was an inventor, and that she invented frequency hopping, which we all use in today's day and age, when texting and using the Internet to share messages. It was very interesting to read this book with my girls, and I found myself learning at the same time. And, they say you stop learning as you get older...I don't know about you, but I beg to differ, especially with books I share with my girls, as I learn about people like Hedy Lamarr, who was never discussed in textbooks or school. As we celebrate Women's History Month this month, why not consider picking up the recent release, "Hedy Lamarr's Double Life" to share with your kids. If you homeschool, this would be a great addition to your Women's History studies. I plan to take the girls to the USS Sub Base in Groton, to show how Hedy's inventions help with how missiles and the military secure their signals and messages. I don't remember seeing Hedy mentioned at the museum. But, I also wasn't aware of her as an inventor, so it will be nice to see if there is mention to her invention at the museum. We have had this book for a couple weeks, and the girls can't get enough of it. Yes, it is a little technical and goes into detail on how frequency hopping works. But, this is what my girls like. And, they also like seeing how a famous actress also pursued other hobbies like inventing. It shows that they can do anything they set their mind to, and have a passion for, just like Hedy Lamarr did! Thanks to the kind folks at Sterling Publishing, one lucky reader will win a copy of Hedy Lamarr's Double Life. To enter, please complete the entries on the Rafflecopter form below. Good luck!